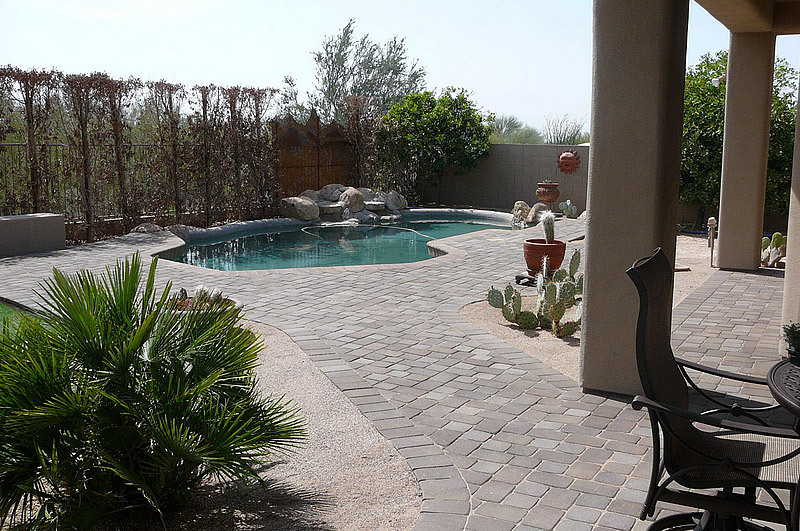 Phx Pavers & Landscaping have been custom designing and installing patios and pool decks throughout greater Phoenix, AZ for many years. We service Scottsdale, Paradise Valley, Cave Creek, Carefree, Peoria, Phoenix, Arizona and their surrounding areas. We have built many beautiful patios and pool decks for both residential and commercial properties. If you are renovating or installing a whole new outdoor living area then we are the company for you; we are the outdoor living specialists. It is no wonder that the addition of an outdoor living area has become one of the most popular landscape renovation projects of late. There are so many benefits to having a patio, pool deck, outdoor kitchen or outdoor fireplace. You will not only be increasing the aesthetic appeal of your landscapes but you will also be adding more function also. You will find yourself spending a lot more time outdoors simply relaxing or entertaining friends and family! Our team of professional landscape designers and landscape contractors specialize in the installation of pavers for a wide array of applications. We have a gained a reputation in the industry and maintain it by providing top notch craftsmanship and innovative designs. Whether you are renovating or extending your existing patio or perhaps you are installing a new one, Phx Pavers & Landscaping specializes in all types of patios and decks. We understand that the patio area is really important and needs to be a beautiful area but also a practical one. Let our designers come up with a new patio deck design for you. Our contractors have all the experience required to build you a patio out of any type of material you may request. Some of the more popular materials include concrete pavers, brick pavers or natural stone pavers. Wouldn't you like to be able to have some really great get-togethers on your patio? Well Phx Pavers & Landscaping can help you there. We can take your patio to the next level and also incorporate an outdoor kitchen set up which will allow you to cook some awesome meals for your guests. We can also add an outdoor fireplace or fire pit which will allow you to use your patio even through the cooler months of the year. Let us turn your patio into an entertainer delight! Have you just had a swimming pool installed and are in need of some pool decking? Or perhaps you have had your pool for many years and are need of some pool deck renovations? Phx Pavers & Landscaping has it all covered when it comes to pool decks. We can custom design and install a new deck or upgrade your existing one. Our team of designers and contractors has all the knowledge and experience to create a truly unique pool deck for your property. The pool decking is an important feature for it needs to safe and practical as well as visually pleasing. The decking needs to be slip resistant so that it is safe for those using the pool and to prevent any accidents. Let us help you choose the right type of material for your pool deck. The team at Phx Pavers & Landscaping will make your custom deck design suited to your pool area, the space you have available and the rest of your landscape surroundings. Take a look at our portfolio and see some of our stylish pool deck designs. Do you currently have a small concrete slab for a patio? Would you like to extend it and make it larger and a proper entertaining space? Then the team at Phx Pavers & Landscaping is the right company for you. We specialize in patio remodeling and extensions. We will take your old patio and turn it into the patio of your dreams. Your property will end up with an awesome outdoor living area where you can add some outdoor furniture or perhaps even an outdoor kitchen; the sky is the limit! The same applies to your pool decks. If you have a small space surrounding your pool and would like to extend it then we can help you there too. Wouldn't it be great to have more space for the kids to play around the pool and to even put in some nice pool lounges for you to sit and relax while supervising the children swimming? We are the deck extensions specialist serving the greater Phoenix, AZ region. If its pool deck remodeling you are after then contact us today and we will get you on your way to having the pool deck you have always wanted. Clients often ask us if it's possible to lay pavers over our existing concrete slab? And the answer is yes we can! We can change the whole look of your old concrete patio or pool deck. Let the team at Phx Pavers & Landscaping beautify and extend your concrete slab with the addition of concrete pavers. Not only can we give you a bigger area if you have the space, but we will also enhance the overall aesthetics of your patio and pool decking. There is a new line of concrete veneer pavers on the market today that are manufactured for the purpose of being installed on top of concrete. They are half the width of traditional pavers allowing us to install them directly on top of your old concrete slab. This saves so much on demolition costs and is less evasive. These concrete veneer pavers also come with a lifetime warranty. So get in touch with the team at Phx Pavers & Landscaping for all of your patio and pool deck remodeling and extension projects! Are you tired of your old and boring looking pool deck? Then Phx Pavers & Landscaping is the right company for you. 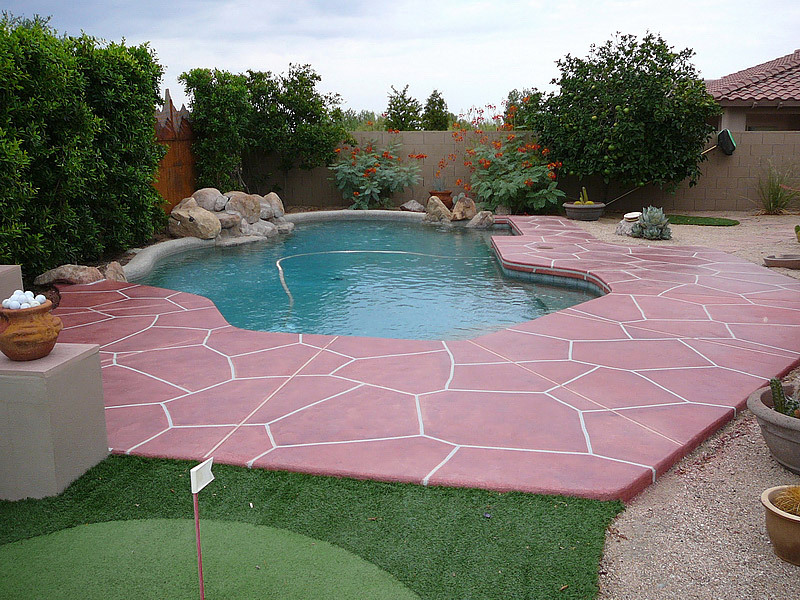 We have been transforming the look of pool decks throughout Phoenix, AZ, for many years and with great success. We service Scottsdale, Paradise Valley, Cave Creek, Carefree, Anthem,Peoria, Phoenix and the surrounding areas. We will transform the look and function of your current pool deck and make it a beautiful feature on your property. Pool deck remodeling doesn't have to be expensive, or evasive, as there are many options for you to choose from. Our team of professionals will sit down with you and work out what type of material will be best for your particular project. There is a large range of materials that can be applied directly over the top of your existing pool deck surface material. 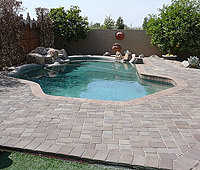 Phx Pavers & Landscaping is your pool deck resurfacing specialist in Phoenix, AZ. Leave the job of overlay pool decks to the professionals for we have all the expertise and experience to get the job done right and efficiently. If you want to spice up the look of your pool deck without all the hassle and extra cost of having to remove the existing surface material, then overlay is the ideal product for you. We can lay thin pavers over an existing pool deck surface. 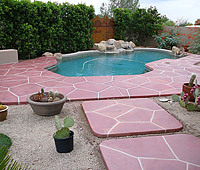 This is the affordable way to give your whole pool area a great new look by adding color, texture and various patterns. These design possibilities are endless with the use of pavers when resurfacing and remodeling your pool deck. Pool decks can be overlay in a variety of materials to make it stand out and become a great focal point for your backyard. One of the most popular resurfacing materials is undoubtedly concrete pavers. 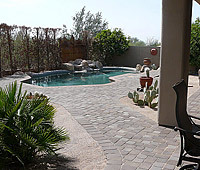 Concrete paver overlay is our specialty here at Phx Pavers & Landscaping. With the use of new thin pavers that are more beautiful and much thinner than earlier types of pavers we will remodel your existing pool deck and have it complement the rest of the elements in your landscape setting. Worried about the cost? Then worry no longer. With a concrete veneer all we need to do is resurface your pool deck with an overlay to bring it back to life. Having cool pool deck resurfacing doesn't have to cost an arm and a leg. 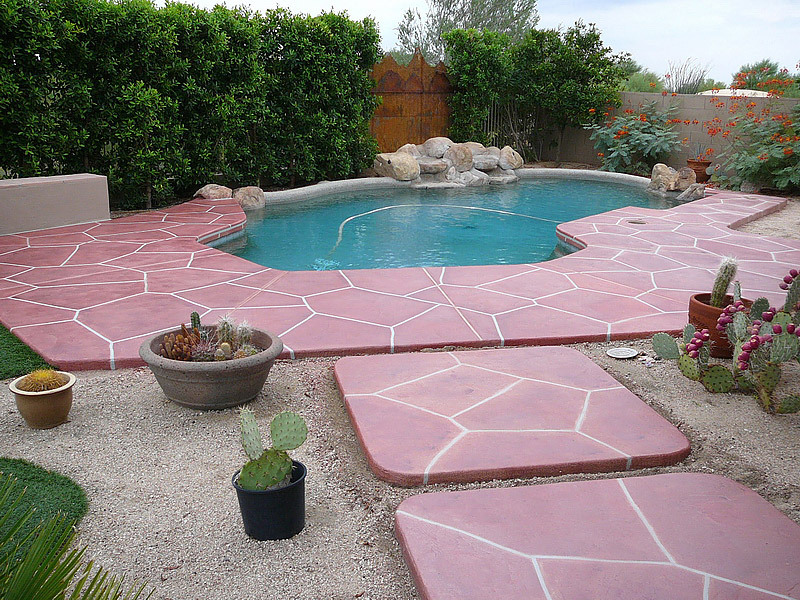 When it comes to resurfacing options, Phx Pavers & Landscaping will guide you in the right direction. The great thing about concrete paver overlays is that it is easy to do, for there is no need to remove any existing concrete. It is also a great option because you can choose from many type's of paver's for your project. 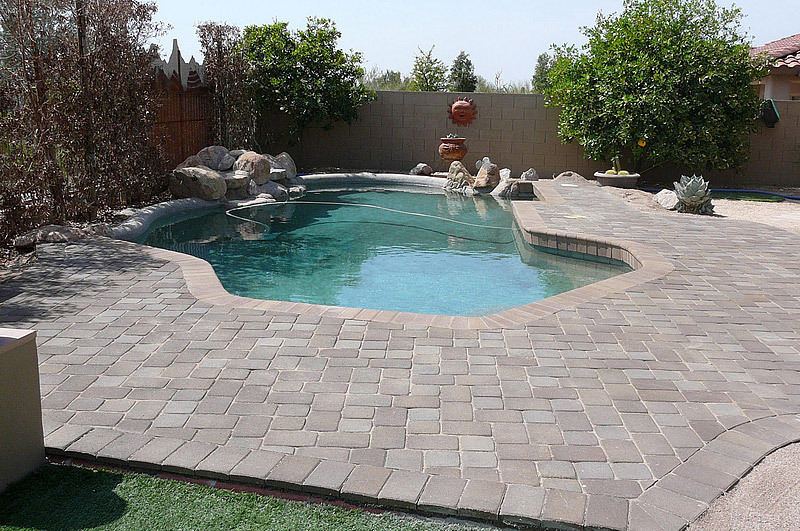 We will help you choose the right type of thin paver overlay for your particular pool deck. Many of the overlay products on the market today are ideal for use around swimming pools. They have qualities, such as being the coolest product for temperature, even cooler than traditional cool deck!This means that you will be left with a deck that is not only aesthetically appealing but one that will also last a very long time. At Phx Pavers & Landscaping we can makeover your pool deck in no time and ensure that you will be delighted with the results. Feel free to browse our gallery to see some of our remodeling projects. Contact us today and we will get you on your way to a stunning new pool deck without all the fuss.